You may have an old diary or even a planner that is lying around and that you have not used for the year. Or perhaps you have just used for a few pages but later abandoned it in favour of another diary. We would be heading to a new year and seeing the unused diary or planner would serve as a bad reminder of wasted money or a past mistake. You may be tempted to get rid of it- however aside from sending for recycling, there is not much of resale value in it. Chances are, you would have bought your diary because you like the design. It would be a real pity to throw it away. 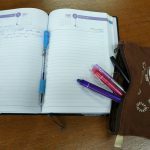 Now before you throw your expensive diary or planner into the trash or for recycling, let me share with you a way that you can repurpose your old diary or planner. 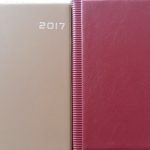 Most diaries being sold no longer come with specific dates especially starting from the last 5 years or so. For me, I always require a diary with daily specific dates especially at work previously because I was using it to record down project and other deadlines that can be due next week, next month or within a few months. I could not make use of those diaries that does not come with dates. If you are like me, and have one of those diaries with daily dates lying around, don’t despair. In fact, I had a diary with dates which I specially bought from Thailand which was only used up to May this year. I was using it for work but stopped using it after I left my company. When I bought a new diary for next year, (an inexpensive diary from Mr DIY which I love the colour brown) I tested the new layouts for me to use in my current diary. In between, there are about 6 months’ worth of un-used good quality daily pages that I plan to repurpose. Have you ever think that a diary with dates make an excellent journal or notebook? Reason being, a diary that contains daily dates already act as a page marker- ie there are dates on every page such as Jan 1, Jan 2 and so on. The diary may also come with a whole year overview where the entire 365 days are in a page (usually people would use it record down important dates or birthdays). What you can do is to use the year overview as a “table of contents”. For example, you read this good article about organizing that you would like to jot down some pointers. I know, we can always bookmark the page- but it can get a little overwhelming as after a while the bookmarked pages accumulate. Sometimes we can also lose all bookmarked pages when something happens to the PC. Personally I find writing down makes things more clear. Sometimes I read a very profound and useful information- but such info is often forgotten with time. When I write down the information, the idea gets more clearer. As a blogger I also often experimented with layouts and plugins. I find it very useful to be able to jot down all these progress in a single book. Therefore for non time sensitive info, a diary is useful to jot down the details. Then use the yearly overview as a ‘table of contents’. 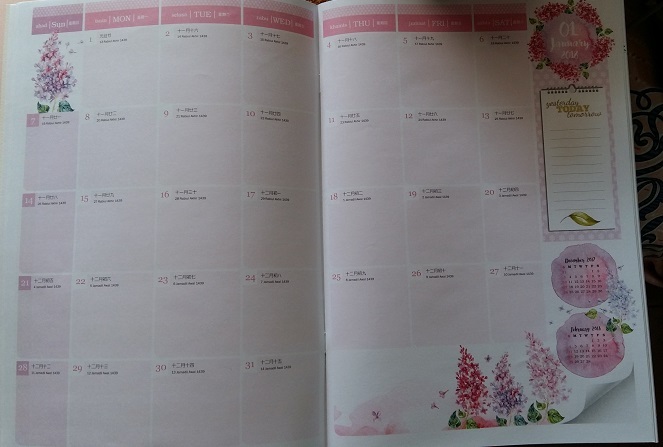 If you do not have a yearly overview in your diary, you can actually get some nice pieces of paper, cut it out to be of the same layout of your diary and use it as a table of content. Usually in front of diaries there are a lot of information such as calendar, world capitals, conversion metrics, calorie counters, public holidays, emergency contact numbers, etc coming up to at least 5 or 6 pages. You can actually create your table of content and paste it over those pages. Else if you are worried that it gets harder to write after you have pasted the paper, you may want to staple it first on the page and then paste it once you have completed the page. 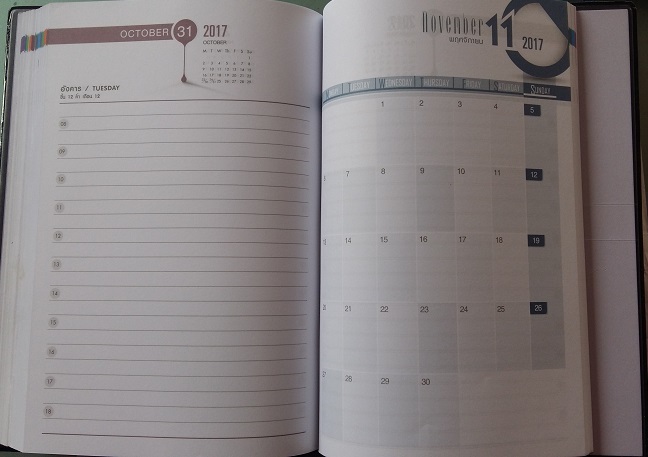 As for the daily pages- they usually contain dates and can get a little confusing as you may potentially mix up the dates. What you can do is either to consciously ignore those dates, knowing that you are repurposing the diary as a journal or notebook. Else you can do simple tasks like strike off the date/ month or if you prefer, run over with a dark marker, sticker or washi tapes. But daily if you put sticker or washy tapes it can get a little expensive but for some people, it brings out the creativity in them. Nowadays, I am using the old diary to jot down blog post ideas that I have. Really, I do not write it down, I would forget. I usually take the diary with me around the house… for example if I am working on my laptop, the diary would be next to me. When I get ideas that I wanted to do but do not have time to work on them yet, I scribble them down. This has helped me tremendously because when I run out of inspiration, I could refer to my diary. After I have written a particular article, I would strike off the info. However assuming that you have such a date bound planner lying around unused in your home. What could you possibly do with it? What I did in the past with unused planners? Because in the past I have tried to figure out various planning systems, often I ended up with planning tools that I had bought but did not use. Each year, costs of items are increasing. A case in point, planner which I bought for less than 6 bucks suddenly cost more than 10 bucks this year. Or sometimes, I decided that I want to start planning in the middle of the year or at odd months where I could not get hold of such planners (because date sensitive planners are only sold between November to February each year and then taken off the shelves and unsold copies are sent back to the manufacturers). 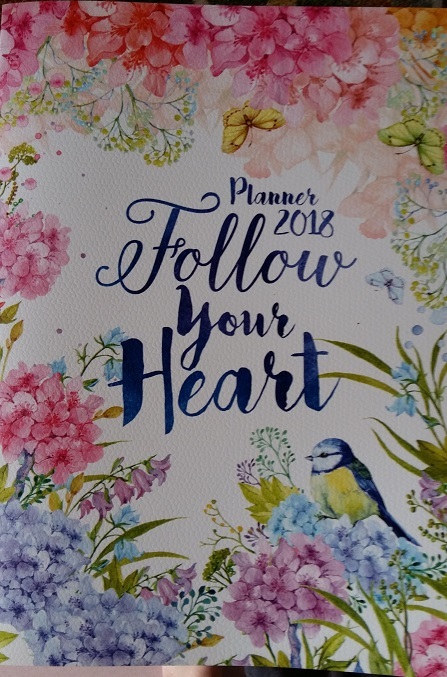 The only planner that I had in my hands would probably be one that I had bought the previous year. I would then strike off the year and replace with the correct year and dates. It does not look nice but nowadays…. there are always stickers and washi tapes that you can use to go over it. My advice: No need to do for the entire year, just try for a month or two to see if it is for you. 2. Use it to record down blog updates- stats, earnings, etc. I struck out and replace with the proper dates then I wrote down the matrix of individual blogs- in colour code (I assigned a different colour for every blog). I prefer looking at a monthly overview to track performance and how my blog went. Previously I was learning the Thai language- hence I use it to write down a Thai word each day to learn it. I use coloured pens to make it attractive so that I would look at it again and again. Above are some of the ideas that I have tried out. I usually buy diaries and planners that has designs which I love hence it is sad to see it go to waste. 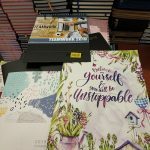 During the very early years, I tend to send unused diaries and planners for paper recycling but in recent years, I figured it is better to repurpose them for other uses. Hopefully, some of the ideas above may be useful for you. What sort of monthly spread planner should you get? Should you maintain the garden yourself or outsource the work? Organizing tasks at work- to use a diary with daily dates or other alternatives? This site is customized by Yin Teing. Hosted by SiteGround.My other sites: Health Blog | Visit Malaysia | Being a blogger | Career AdviceVisit www.yinteing.com for full listing of sites.© 2017- 2019 by Yin Teing. All rights reserved.